I’ve started looking at these. I can’t say that I’m not interested. Really wish the blade had a point on it. However, I can understand why it doesn’t. Still, I carry a 2nd fixed blade, so one of these would work just fine. Also, it is not a weapon. With an effectively pointless design, it is hard for people in charge to say that it is a dangerous weapon in the world place, or even in some schools. It is a tool designed to rescue people. Certainly, an interesting way to get around much of the knife fear mongering in our more erudite locales. That is an interesting point RK! I didn’t really think of this that way, but it’s easier to justify that this knife is a tool rather than a weapon, especially if you were to get this in orange. I’ve handled a few of them and they are very solid knives. Well made and stout – just what you would expect from something like this. Hi Clem, I agree it’s not a cheap knife but $60? Sure I’d love to have one for 60 bucks but having handled a number of knives I’ll tell you – you just couldn’t get a USA made knife with these kinds of materials at this level of quality with a Benchmade warranty for 60 bones. Just my opinion of course. Thanks for reading. This is a specialized tool. It is truly MEANT for professional use by first responders. The ‘tactical’ in tactical folder doesn’t mean military, it means that it is a tool that can be carried, deployed, and employed in as fast a manner as possible. The Triage combines that fast convenience with quality life saving tools. It is a tool for when seconds count. I don’t know of ANY true multi-tools that can match it for speed and ergonomic function in the knife and/or the V-cutter. Also, ‘tactical’ multi-tools are a very scarce breed. I’ve handled and used two of the top shelf choices and neither Leatherman nor Gerber is producing one that’s blade function is as good as a $10 Paraframe. There are some knives with similar features. Boker has a number of emergency blades. However, they’re either Boker Plus or Boker Magnum. However, i wouldn’t trust Boker Magnums too much when the chips are down. The Jim Wagner Boker Plus Emergency would work ok. It is still about $50 bucks. RK, I couldn’t agree more. This is heavily made with premium materials in the USA. It’s absolutely designed and made for first responders. As much as I enjoy a good value as the next guy, if you stop to look at the nice critically a price tag of $60 is just impossible here. If you dont want to pay the 150$ for a Knife, then look at the SOG Escape, its a new knife in their 2012 lineup and it has everything that the Triage has but for 60% I believe. Also if your a SOG Freak like me 🙂 the Escape is awesome. Hey Jack, thanks for the heads up. I haven’t handled an Escape yet. I’ll have to check it out. Thanks! Hah! Well said Tim… and I couldn’t agree more. This is a serious knife designed for professionals. It’s also wonderfully made (in the USA) from premium materials. While I concede that they aint cheap, I have almost always found Benchmades to be worth the premium. Thanks for stopping by. 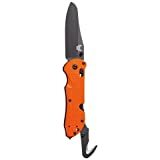 Been looking for this knife in red, as shown here in your review, but now, can only find it in “Rescue Orange”. Have they stopped making red, is my monitor coloring off, or something else? If I cannot buy it from one of the sites which support this page, I guess I will have to go to the secondary market,aka ‘Ebay’ I guess….? Thanks for taking the time to help me out in advance. The knife pictured is actually orange. The pictures do look red, but it’s actually a high visibility orange. We can blame my crappy photography for that. I am an avid knife collector of blades I find useful and occasionally interesting. I work in emercency medicine and own a triage for its one hand function and fast shredding in emergent situations. I agree in it’s priciness but you cannot ask for a lifetime tool to come cheap. EDC it is a little heavy but well worth the toughness. Thanks for stopping by. It is great to hear that you work in emergency medicine and use this knife. As a desk jockey, I can only speculate as to how a true first responder will use a knife like this. Glad you enjoy yours and find it is worth the money. Thanks for the updated review (2016) Dan. Choosing rescue/ first responder gear is a challenge & situational-dependent. Your review of the Triage 915 has given me more to ponder – your reviews have all been excellent and good perspectives. As a former Fire Fighter I struggle with the need for such a knife, but if/when you do….well, $ well spent. The one thing I’d like to see addressed somewhere is first responder advice when you’re treating yourself, by yourself. Tools/knives that can be more easily used one-handed when your injured and may even be using non-dominant hand. Just a thought because I haven’t found much insight on issue anywhere. Thanks for taking the time out to leave a comment. I appreciate the kind words and the feedback. Good point regarding being able to use tools one handed. Since I’m not a first responder, I view the knife through the lens of a layperson, but I’m open to trying to use the knife one handed and with my non-dominant hand to see how it fares. I’m out of town this weekend but will address it on my return as I still have the 915 and still enjoy it as a unique knife in my collection. Thanks again!